Fairlawn’s Jackson Jones competes in the 100 meter run during the Anna Invitational on Saturday. Jones won in 11.24. Russia's Max Bohman competes in pole vault during the Anna Invitational on Saturday. Minster's Dana Prenger competes in shot put during the Anna Invitational on Saturday. New Bremen's Vivian Niekamp competes in pole vault during the Anna Invitational on Saturday. Versailles' Caleb Heitkamp competes in high jump during the Anna Invitational on Saturday. New Bremen's Elli Roetherman competes in high jump during the Anna Invitational on Saturday. Minster's Cody Frericks competes in discus during the Anna Invitational on Saturday. Botkins’ Adriana Jutte competes in 100 hurdles during the Anna Invitational on Saturday. Jutte finished first in 16.06. Lehman Catholic's Lindsey Magoteaux competes in the 100 run during the Anna Invitational on Saturday. Magoteaux won in 13.06. Botkins' Josh Johnson hands off to Alan Fullenkamp in the 1,600 relay during the Anna Invitational on Saturday. 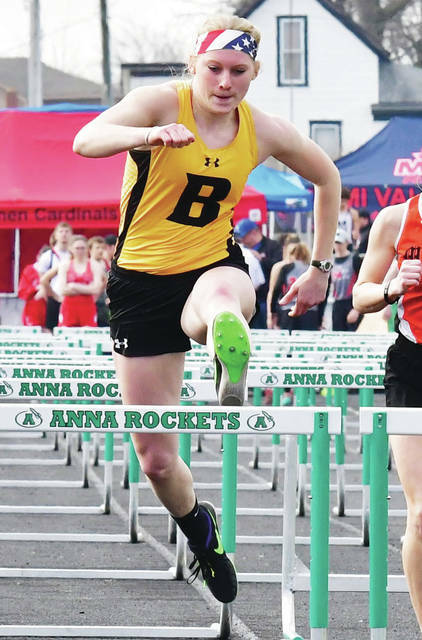 Anna’s Alex Bruggaman runs in the 110 hurdles during the Anna Invitational on Saturday. Bruggaman was first in 16.02. 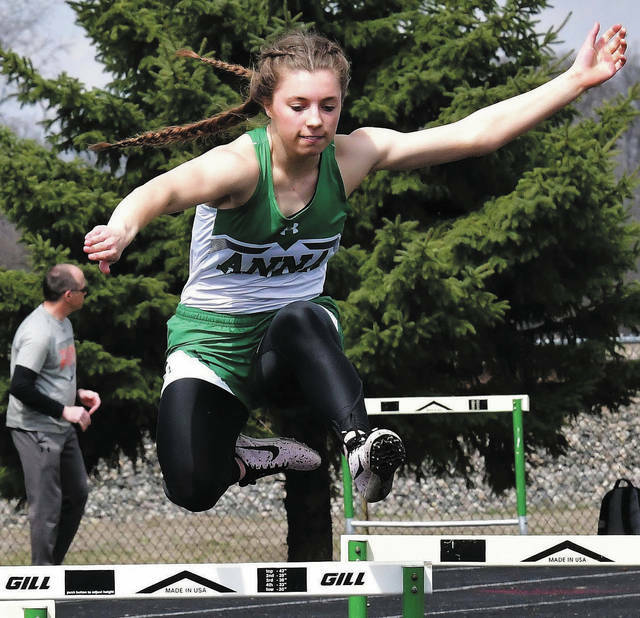 ANNA — Anna’s boys track and field team and Minster’s girls team finished first in Anna’s invitational on Saturday. The Rockets’ boys squad finished first out of 12 schools with 137.5 points while Minster was second with 105. Houston was fourth, Fairlawn was fifth, Russia was sixth, Versailles was seventh, Botkins was eighth, Lehman Catholic was ninth and New Bremen was 10th. 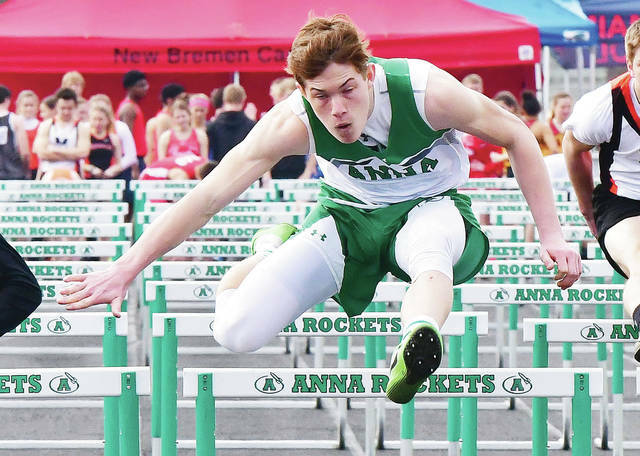 Anna’s Alex Bruggaman was first in the 110 meter hurdles in 16.02 seconds and Ethan Kitchen was first in the 300 hurdles in 42.40. Ian Bollheimer was first in the 200 meter dash in 23.38 and Kamren Steward was first in long jump with a leap of 18-8.75. Colton Nanik was second in the 300 hurdles in 42.64. Bollheimer was second in the 100 dash in 11.34 and Jeffrey Richards was third in 11.47. Bart Bixler was second in the 400 dash in 52.74. Isaac Dodds was second in discus with a throw of 123-7 and Garhett Keener was second in high jump by clearing 5-10. The Rockets were first in the 800 relay in 1:33, first in the 400 relay in 45.07 and second in the 1,600 relay in 3:39. Minster’s Broc Miller was first in pole vault by clearing 12-6. Jason Siefring was third in the 110 meter hurdles in 17.72. Alex Albers was second in the 1,600 run in 4:48 and Sam Schmiesing was third in discus with a throw of 11-6. Carson Prenger was third in long jump with a leap of 18-0.5. The Wildcats were third in the 3,200 relay in 8:43, second in the 800 relay in 1:35 and third in the 400 in 46.92. Houston was second in the 3,200 relay in 8:37. Tristin Freistuhler was first in the 1,600 run in 4:44 and Ethan Knouff was third in the 800 in 2:05. Freistuhler was second in the 3,200 in 10:27 and Wesley Jester was third in high jump by clearing 5-8. The Wildcats were third in the 1,600 relay in 3:42. 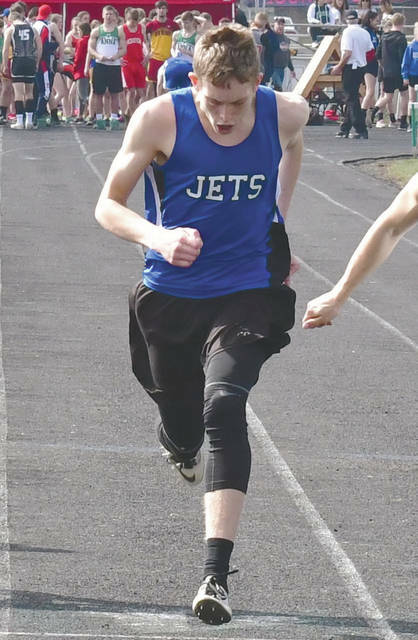 Fairlawn’s Jackson Jones was first in the 100 meter dash in 11.24 while Alan Asher was first in the 400 dash in 52.47. Jones was first in high jump by clearing 6-0. Jones was second in the 200 dash and Asher was third in 24.17. The Jets were second in the 400 relay in 46.64. Russia’s Jason Siefring was second in the 110 hurdles in 16.50. Michael York was third in shot put with a throw of 44-5 and Max Bohman was second in pole vault with 12-0. Versailles’ Brayden Keihl was first in shot put with a throw of 45-9.75. Botkins’ Marcus Lee was first in discus with a throw of 123-8. Collin Watterson was third in the 3,200 run in 11:05. Lehman Catholic’s Brendan O’Leary was third in the 300 hurdles in 43:82. Michael McFarland was second in long jump with a leap of 18-6. New Bremen’s Jacob Rindler was second in shot put with a throw of 44-5.5. Minster’s girls team finished first out of 11 squads with 114.5 points. Versailles was third with 75.5. Anna was fourth, Russia was fifth, New Bremen was sixth, Botkins was seventh, Lehman Catholic was eighth, Houston was 10th and Fairlawn was 11th. Minster’s Kaitlynn Albers was first in the 1,600 run in 5:33 while Madeline Magoto was first in the 800 in 2:22. Gwen Meiring was first in the 3,200 run in 12:06 while Mackenzie Bohman was second in 12:23. Mason Pohl was third in the 1,600 run in 5:50. Ella Mescher was second in high jump by clearing 5-0 and Hannah Pack was third in long jump with a leap of 14-6. The Wildcats’ finished first in the 3,200 relay (10:08) and first in the 1,600 relay (4:17). Versailles’ Luck Prakel set a meet record in pole vault by clearing 11-7. Liz Watren was first in the 400 dash in 1:01. Ali Moran was second in the 100 meter dash in 13.43. The Tigers were third in the 400 relay in 54.13 and third in the 1,600 in 4:22. Anna’s Hannah Shoemaker was first in the 300 meter hurdles in 45.71 and first in the 200 dash in 26.37, both of which are new meet records. She was second in the 100 meter hurdles in 16.43 and third in pole vault by clearing 9-0. Kaitlyn Harris was third in the 100 meter dash in 13.6. The Rockets were third in the 800 relay in 1:53. Russia was second in the 3,200 relay in 10:11. Ella Hoehne was second in the 800 run in 2:29 and Becca Seger was third in the 400 dash in 1:03. Sophie Francis was third in high jump by clearing 4-10 and second in long jump with a leap of 14-9. New Bremen’s Elli Roetgerman was first in high jump by clearing 5-0. Kayla Bergman was third in discus with a throw of 112-5. Vivian Neikamp was second in pole vault with 9-0. Botkins’ Adriana Jutte was first in the 100 meter hurdles in 16.06 and second in the 300 hurdles in 49.07. Emma Koenig was second in the 1,600 run in 5:37. Grace Homan was first in shot put with a throw of 41-7.75 and second in discus with a throw of 122-0. 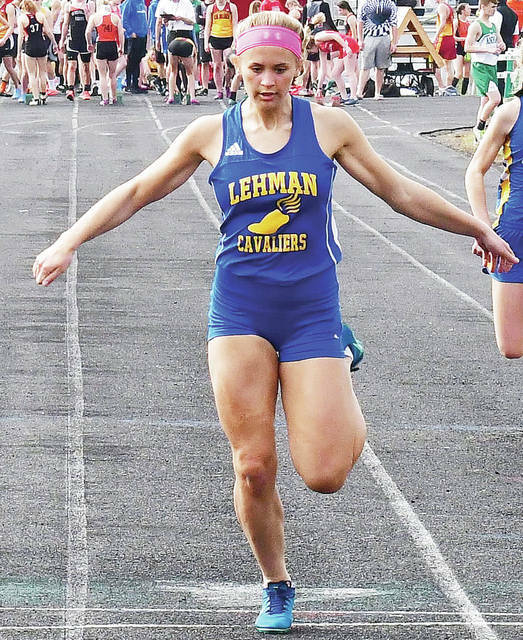 Lehman Catholic’s Lindsey Magoteaux was first in the 100 meter dash in 13.06 and second in the 200 dash in 26.54, just a bit behind Anna’s Shoemaker. Rylie McIver was third in the 300 hurdles in 50.62. The Cavaliers were first in the 800 relay in 1:50 and first in the 400 relay in 52.14. Houston’s Shelby Ayers was first in discus with a throw of 122-6 and third in shot put with 35-7. Ava Knouff was third in the 3,200 run in 12:38. Fairlawn’s Madison Huelskamp was first in long jump with a leap of 15-9. Jackson Center completed a busy weekend on Saturday. A night after competing in Riverside’s invitational, the Tigers competed in the Ridgemont Antique Valley Invitational. Jackson Center’s girls squad finished third out of six schools while the boys finished fourth. Katie Clark finished first in girls shot put with a throw of 27-11.65 and Morgan Huber was second in the 400 meter dash in 1:08. The Tigers finished first in the 1,600 relay in 4:48, second in the 800 relay in 2:03, second in the 400 in 58.8 and second in the 3,200 relay in 13:34. Jaden Mullen was first in the boys 100 meter dash in 12.0. Sean March was second in the 1,600 in 5:11.6. Sidney started off a home tripleheader with Indian Lake and Anna on Saturday with a win over the Lakers. It was tied 1-1 after three innings before Sidney scored one in the fourth, three in the fifth and one in the sixth to win it. Sidney had seven hits and two errors while Indian Lake had five hits and no errors. Mitchell Larger picked up the win on the mound. He gave up four hits and had nine strikeouts with two walks in five innings. Lathan Jones was 2 for 3 with 3 RBIs for Sidney. Both his hits were doubles. Ryan Schloss was 2 for 4 and Ryan Cagle was 2 for 3. EJ Davis had three stolen bases. The Rockets beat the Lakers in the second game of a tripleheader on Saturday in Sidney. They fell behind 1-0 after the first inning but scored two in the third, three in the fourth and five in the fifth to pull away. Anna had 10 hits and two errors while Indian Lake had four hits and four errors. Kyle Evans was 2 for 5 for Anna with 2 RBIs while Tyler McClay was 2 for 4. Cole Maurer scored two runs and had 2 RBIs and Andrew Scully scored three runs. Carter Elliott earned the win for Anna. He pitched five innings and allowed one earned run on three hits and two walks with three strikeouts. Anna earned its second 10-1 win of the day to close out a tripleheader on Saturday in Sidney with a victory over the Yellow Jackets. After a scoreless game through the first three innings, Anna scored four runs in the fourth to take control. The Rockets had 14 hits and two errors while Sidney had five hits and four errors. Jacob Robinson pitched a complete game for Anna. He didn’t allow an earned run and had five strikeouts with three walks in seven innings. Tyler McClay was 3 for 5 with 2 RBIs while Kyle Evans was 2 for 4 with 3 RBIs and three runs. Jarred Siegle was 3 for 4 and scored two runs. Wil Luthman was 2 for 3 and Andrew Scully had a double. Caleb Harris was charged with the loss for Sidney. He pitched four innings and allowed one earned run on six hits with two strikeouts and two walks. The Redskins scored five runs in each of the first and third innings to take an 11-0 lead on their way to a big victory in the first game of a tripleheader on Saturday in Fort Loramie. Fort Loramie had 13 hits and no errors while Northwestern had two hits and four errors. Nathan Raterman was 2 for 2 with two doubles for Fort Loramie and scored three runs. Jared Middendorf picked up the win on the mound. He pitched two innings and allowed one hit with two walks and had five strikeouts. Northwestern took a 4-2 lead after two runs in the fifth against Minster, but the Wildcats scored one in the fifth and two in the sixth to close out a victory in the second game of a tripleheader in Fort Loramie. Minster had six hits and three errors while Northwestern had four hits and three errors. Ethan Lehmkuhl earned the win for Minster. He pitched 2 1/3 innings and didn’t allow a hit. He had four strikeouts and three walks. Trent Roetgerman scored two runs and stole two bases. Carter Mescher hit an inside-the-park home run in the ninth inning to lift the Redskins to victory in the third game of a tripleheader on Saturday in Fort Loramie. Mescher hit a shot to left field that hit off of a diving Eric Schmidt. Mescher was able to race around the infield and beat a throw home by the Wildcats. The Redskins had eight hits and three errors while Minster had seven hits and two errors. Shane Hilgefort was 2 for 3 with 1 RBI for Fort Loramie while Eli Rosengarten was 2 for 3 and scored one run. CJ Billing and Hilgefort each had a double. Nathan Raterman earned the win. He pitched four innings and allowed three hits. He gave up one walk and had three strikeouts. Jacob Niemeyer picked up the loss for Minster. He pitched 4 1/3 innings and allowed one earned run on five hits with two strikeouts. Kyle Riethman was 2 for 4 for the Wildcats. Fairlawn 7, Mississinawa Valley 6, 11 inn. The Jets scored one run in the top of the 11th to win the first game of a doubleheader on Saturday at Mississinawa Valley. Fairlawn had 14 hits and no errors while the Blackhawks had 11 hits and one error. Jordan Lessing was hit by a pitch in the 11th and stole second while Ethan Westerbeck was at the plate. Westerbeck then hit a single on a ground ball to center field to score Lessing. The Blackhawks went down in order in the 11th. Lessing was 3 for 4 and scored three runs. Drew Maddy was 3 for 6 and scored three runs. Skyler Piper and Ashton Piper were both 2 for 5. Bother Pipers had one double and Lessing had two doubles. Maddy and Lessing each had three stolen bases. Keith Orndorff picked up the win for Fairlawn. He pitched 6 2/3 innings and gave up six earned runs on nine hits and three walks. He had three strikeouts. The Blackhawks scored eight runs in the first inning to take control of the second game of a doubleheader on Saturday at Mississinawa Valley. The Raiders lost in run-rule fashion against the Redskins on Saturday at the St. Henry Invitational. St. Henry scored seven runs in the fifth inning to end the game. The Redskins had 10 hits and no errors while Russia had two hits and four errors. Grant Saunders picked up the loss for Russia. He allowed four earned runs on six hits in 4 1/3 innings and had three strikeouts. The Raiders scored two runs in the first to take the lead and pulled away with four in the sixth to earn a win over the Flyers on Saturday at the St. Henry Invitational. Russia had five hits and one error while the Flyers had four hits and no errors. Daniel Kearns earned the win for the Raiders. He pitched a complete game and gave up one earned run. He had nine strikeouts and two walks. Will Sherman was 2 for 4 and had a double. Kearns had 2 RBIs. The Redskins scored one run in the fifth and one in the sixth to rally and beat Riverside in a nonconference game on Saturday in Wapakoneta. The Pirates had seven hits and eight errors while Wapakoneta had five hits and six errors. Levi Godwin picked up the loss for Riverside. He allowed one earned run in two innings of work. Kale Long and Zane Rose were both 2 for 4 for the Pirates and scored two runs. Rose had a double. The Tigers scored three runs in the first inning to set the tone early in the first game of a nonconference doubleheader on Saturday in St. Marys. Versailles had 10 hits and one error while the Roughriders had five hits and two errors. Nathan Wagner picked up the win for Versailles. He gave up three hits in six innings and had four strikeouts. Will Eversole was 3 for 3 with 2 RBIs and two runs. He had two doubles. Zach Griesdorn, Brayden Robinson and Garrett Toops each had two hits. Griesdorn and Toops both had one double. Wagner had two stolen bases. Adam Kremer pitched complete game and gave up two hits as the Tigers closed out a doubleheader on Saturday in St. Marys. Kremer struck out four batters and got through seven innings on 95 pitches. Versailles had seven hits and three errors. The Roughriders committed three errors. Brayden Robinson was 2 for 4 with two runs for the Tigers. He had a double. The Trojans lost 9-7 and 4-2 in a doubleheader at Ansonia on Saturday. 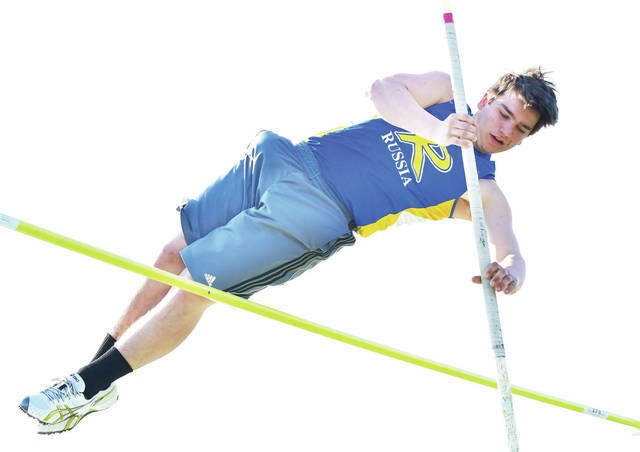 Russia’s Max Bohman competes in pole vault during the Anna Invitational on Saturday. 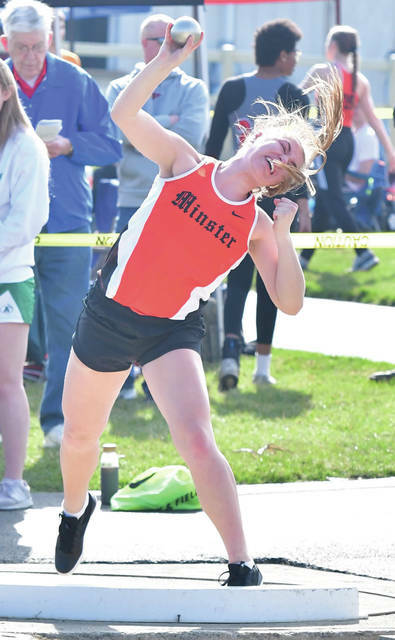 Minster’s Dana Prenger competes in shot put during the Anna Invitational on Saturday. 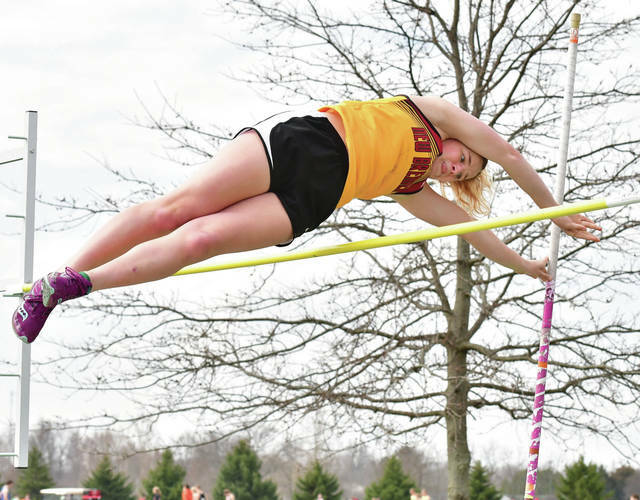 New Bremen’s Vivian Niekamp competes in pole vault during the Anna Invitational on Saturday. 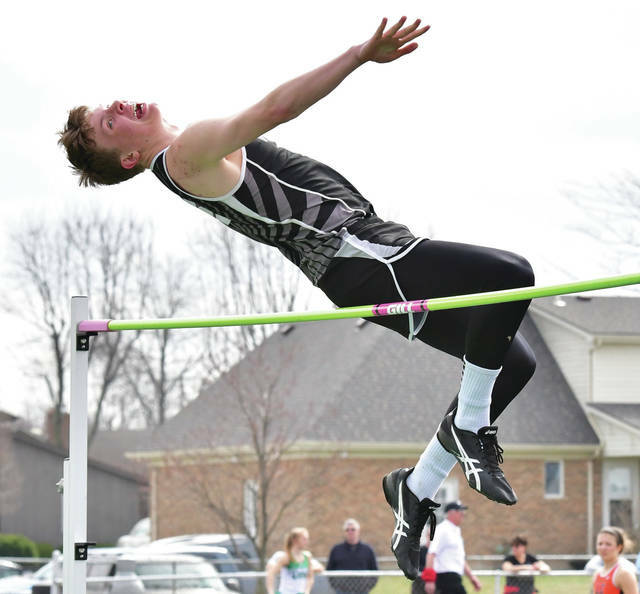 Versailles’ Caleb Heitkamp competes in high jump during the Anna Invitational on Saturday. 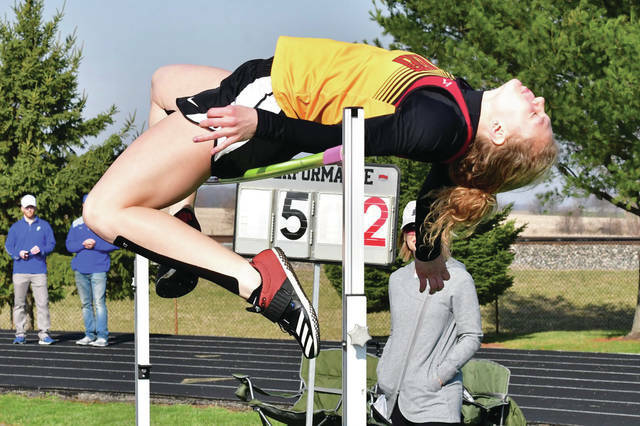 New Bremen’s Elli Roetherman competes in high jump during the Anna Invitational on Saturday. 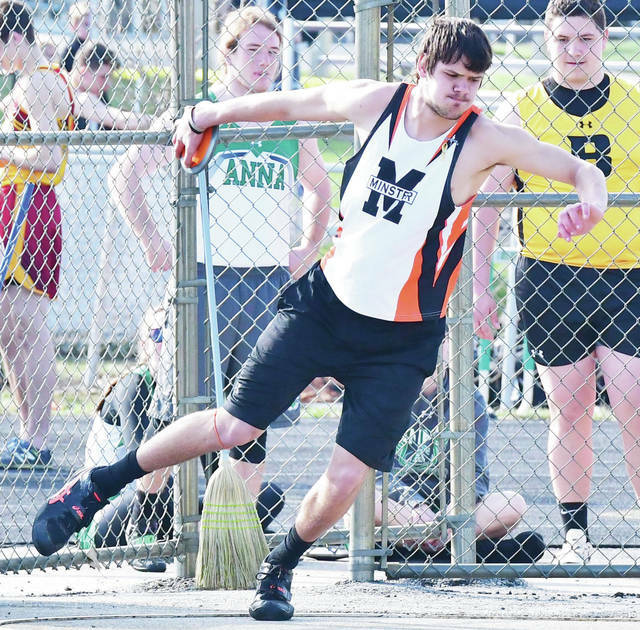 Minster’s Cody Frericks competes in discus during the Anna Invitational on Saturday. Lehman Catholic’s Lindsey Magoteaux competes in the 100 run during the Anna Invitational on Saturday. Magoteaux won in 13.06. 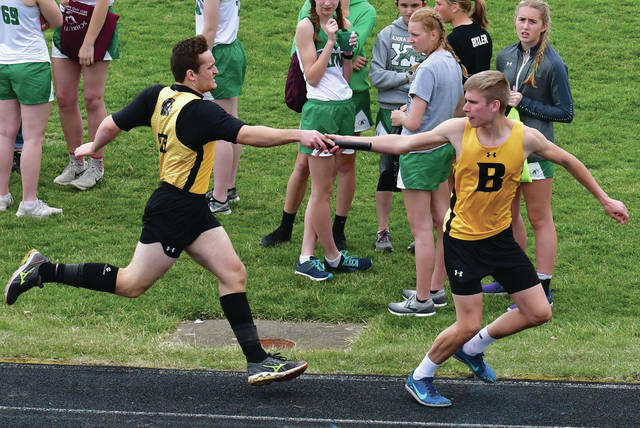 Botkins’ Josh Johnson hands off to Alan Fullenkamp in the 1,600 relay during the Anna Invitational on Saturday.